A weekly’s campaign for a gold post box in honour of Olympic champion Lizzy Yarnold has seen tens of thousands of people sign its petition on the first day. 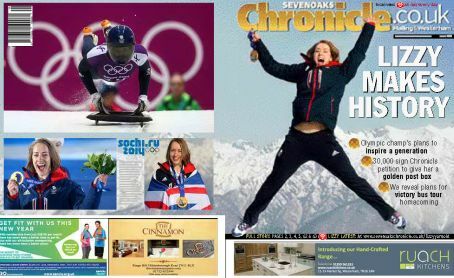 The Sevenoaks Chronicle started its Paint It Gold For Lizzy campaign on Saturday after the Royal Mail said it would not honour the women’s skeleton winner in the same way as London 2012’s gold medalists. And a petition started by the paper on Tuesday on the website change.org attracted 26,000 signatures in the first 24 hours. Lizzy’s victory at the Winter Olympics in Sochi is being celebrated by the Chronicle with a wrap-around front page, pictured below, along with six pages of coverage inside. The paper’s campaign has also been backed by the Olympic champion herself, while Chronicle editor Gabriel Shepard has offered to pay for the gold paint himself. Said Gabriel: “The response has been overwhelming but shows how much public support the campaign has both on a local and national basis. “Not only would a golden post box be a fitting tribute to Lizzy’s fantastic achievement but it would also help to inspire a new generation of world class athletes. The campaign has also gained hundreds of retweets using the #paintitgoldforlizzy hashtag on Twitter.